Timeline of what Trump knew about Michael Flynn’s Turkey connection. A timeline of what we know, and what Trump knew, about Michael Flynn’s relationship with Turkey. Donald Trump talks to the media as Lt. Gen. Michael Flynn stands next to him in Palm Beach, Florida, on Dec. 21, a month after Flynn’s lobbying had been widely reported. Michael Flynn’s registration as a foreign agent raises questions about his work for Turkish interests and who knew about it. Did Flynn completely deceive leaders of the Trump transition team and the White House? Or did they look the other way? This is a reconstruction of what was reported about Flynn’s work at the time, either publicly or directly to the Trump team. Aug. 9: Flynn, while serving as an adviser to Donald Trump on military and Middle East issues, signs a contract with Inovo, a Dutch-based company owned by Ekim Alptekin, the chairman of the Turkish-U.S. Business Council. The contract says Flynn’s company, Flynn Intel Group, will be paid $600,000 for three months of work. Sept. 19: Flynn and Alptekin meet in New York with Turkey’s foreign minister and energy minister. The latter is the son-in-law of Turkey’s strongman president, Recep Tayyip Erdogan. That day, Flynn and Trump meet with the president of Egypt. Sept. 30: Flynn Intel Group publicly registers as a lobbyist for Inovo. Oct. 10: Flynn meets in New York with Turkish community leaders connected to Erdogan’s government. Video from a conversation with Flynn is posted online, along with reports on Facebook and in the Turkish-American press. October: Representatives of Flynn Intel Group meet with aides from the House Homeland Security Committee. They present evidence against Erdogan’s political enemy, Fethullah Gülen, who lives in the United States. Nov. 10: Michael Rubin, a scholar at the American Enterprise Institute, publishes a critique of Flynn’s op-ed, arguing that it “whitewashes” Erdogan’s behavior. Nov. 11: Chuck Ross, a reporter at the Daily Caller, publishes an investigation of Flynn’s work. Ross reports that 1) Flynn’s firm is lobbying for Inovo, 2) Inovo is closely linked to Erdogan and the Turkish government, 3) Flynn’s op-ed reversed his previous positions on Turkey, and 4) the op-ed didn’t disclose Flynn’s financial relationship with Inovo. Trump’s aides almost certainly saw this article. Trump’s communications team had worked with the Daily Caller during the campaign. Ross had asked Trump’s aides for comment on his findings—which they declined to give—and in the 24 hours before he published his report, the transition team gave the Daily Caller two exclusive stories. Nov. 14: Rubin writes an AEI blog post titled, “Turkey Jump-Starts Intelligence Operations Against America.” He reports mysterious cash transfers and asks whether the money is going to “un-registered foreign agents” in the United States. In this item, Rubin doesn’t mention Flynn. Also on Nov. 14, Politico notes that Flynn’s deal with Inovo, the Dutch company, resembles Paul Manafort’s use of a Belgian intermediary while working for Russian allies in Ukraine. Like the Daily Caller, Politico runs its story by the Trump transition team but gets no comment. Nov. 15: The Washington Post reports that a “person close to the transition” says Flynn didn’t tell the Trump campaign about his financial ties to Turkey when he published his Nov. 8 op-ed. This is the first public comment from Trump’s aides, confirming that they’re aware of the Turkish connection and that they’ve looked into what Flynn disclosed. They depict the story as a political problem, not a national security problem. The Post reports: “Senate confirmation of Flynn, who has also voiced interest in serving as director of national intelligence, could be difficult, said the person close to the transition team.” This account is backed up by the New York Times, which indicates that the transition team, for similar reasons, decided not to nominate Flynn to run the CIA. By appointing Flynn instead as his national security adviser, Trump can shield him from the confirmation process. Nov 17: Alptekin tells the Wall Street Journal that he hired Flynn Intel Group in part “to improve U.S.-Turkish relations” and for “advice on where the security relationship between the U.S. and Turkey was going.” Alptekin also tells the Intercept that he hired Flynn Intel Group “three months ago” and has paid the company “tens of thousands of dollars.” These statements add detail about the nature and extent of what Flynn has been doing. Again, Trump’s transition team is invited to comment but declines. Recent news reports have revealed that Lt. Gen. Flynn was receiving classified briefings during the presidential campaign while his consulting firm, Flynn Intel Group, Inc., was being paid to lobby the U.S. Government on behalf of a foreign government’s interests. Lt. Gen. Flynn’s General Counsel and Principal, Robert Kelley, confirmed that they were hired by a foreign company to lobby for Turkish interests. Nov. 21: Ross documents how Flynn’s statements have changed since he signed the lobbying contract. Flynn has recast Erdogan from ISIS-coddling Islamist to scourge of terrorists. Dec. 1: Flynn Intel Group files a form claiming that its lobbying work for Inovo has ended. Dec. 9: In a letter to FBI Director James Comey and other officials, two senators request a review of Flynn’s security clearance based on his lobbying for Turkish interests. The letter is made public on Dec. 14. After Jan. 20: Sometime after the inauguration, Flynn and his attorney again discuss the issue with White House lawyers. The two sides have at least two conversations, and Flynn is told again that it’s “up to him.” According to the Associated Press, Flynn’s representatives make clear to the White House counsel’s office that he will register as a foreign agent. 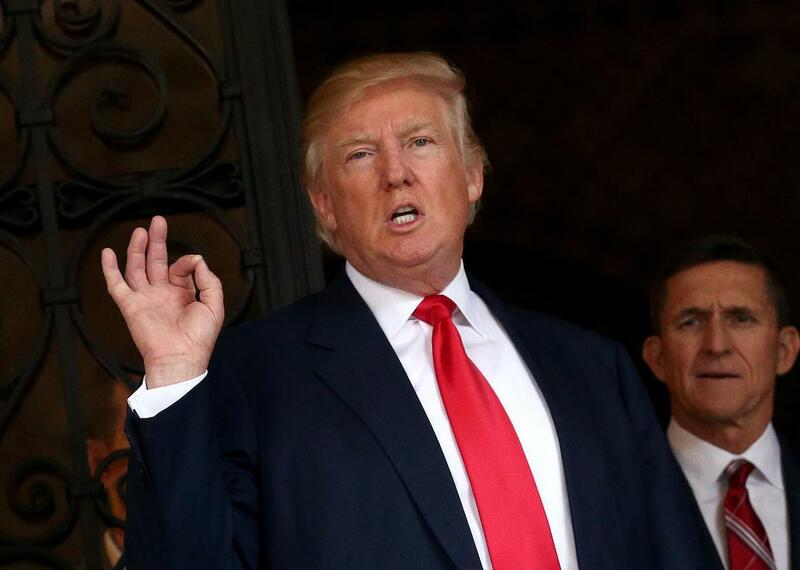 Jan. 22: In a ceremony led by Trump and Pence, Flynn is sworn in as national security adviser. March 10: Spicer is asked why Trump named Flynn as national security adviser on Nov. 18 despite Flynn’s lobbying for Turkish interests. The press secretary replies: “There was no disclosure at the time.” When asked about White House knowledge of Flynn’s work as a foreign agent, Spicer asserts: “Nobody would have known that, because he hadn’t filed as a foreign agent until two days ago.” Later on Friday, the New York Times and Washington Post report that sometime before Trump’s inauguration, Flynn’s attorneys consulted lawyers for the transition team about registering as a foreign agent. March 11: The Associated Press reports that sometime after the inauguration and before he registered as a foreign agent, Flynn’s attorneys “made clear” to the White House counsel’s office that he would register.